Gleefully vicious biography of a New York fashion icon. She edits the fashion world’s bible but couldn’t stay faithful to her husband. That’s Oppenheimer’s take on Wintour’s life: five decades of ruthlessness leading inexorably to huge professional success and crashing personal failures. Oppenheimer (The Other Mrs. Kennedy, 1994, etc.) 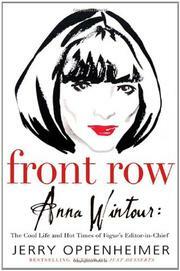 starts with Wintour’s family, Wintour’s adolescent rebellion, her parents’ divorce, her many boyfriends, and her failure ever to graduate from college. At early jobs, she was miles ahead of the other girls in terms of ambition and style, as well as of cruelty (she was dubbed “bacon slicer” for her sharp tongue); more than one coworker also recalls that she couldn’t write copy for her fashion spreads, a handicap she apparently never overcame. Oppenheimer gives equal time to her jobs and her men, here chronicling affairs and there pointing out, delightedly, that Anna spent two years at Bob Guccione’s Viva magazine in the ’70s. The story winds up in the present, presenting Anna at American Vogue (she’d been at British Vogue earlier), twisting S.I. Newhouse around her little finger. Her innovative styling is well documented, as is her slash-and-burn technique of assimilating magazine staff (her once-trusted, recently sabotaged personal assistant was happy to discuss specifics with the author). In fact, the number of sources willing to be interviewed and quoted by name is the best indication of Wintour’s ability to command loyalty. There are details and revelations galore; unfortunately, the author’s completist tendencies—recounting the number of buttons on Anna’s high-school gym uniform, for example—bloat what could be a much more streamlined hatchet job.